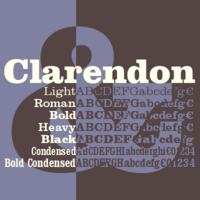 The classical Clarendon calligraphy form originated way back in the year 1845 in England. It was refined by eminent designers of the time Edouard Hoffmann and Hermann Eidenbenz at Haas, almost a hundred years after the origination. This dedicated revival of typeface by Haas in the year 1953, precipitated the revival trends of other fonts later.